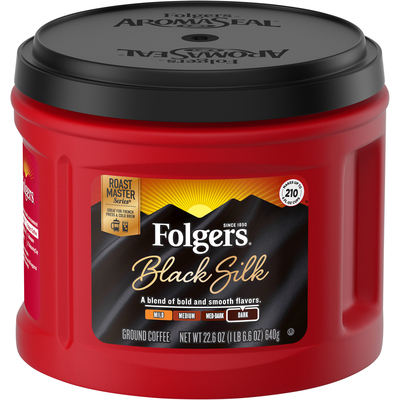 Black Silk Coffee Is Just What Fans Of Dark-Roasted Coffees Are Looking For In A Coffee Cup - Bold Yet Exceptionally Smooth. Interlocking Aromaseal Lid Makes Sure You Enjoy Fresh-Tasting Coffee Every Time. Snap-Tight Lid Helps Seal In Fresh Taste And Aroma. The Inner Seal Peels Away Easily And Eliminates The Need For A Can Opener. Dark-Roast, Ground Coffee Is Designed For Use In Coffeemakers. Canister Holds Enough Coffee To Make Up To 210 Cups (6 Fluid Oz.).. Black Silk Coffee Is Just What Fans Of Dark-Roasted Coffees Are Looking For In A Coffee Cup - Bold Yet Exceptionally Smooth. Interlocking Aromaseal Lid Makes Sure You Enjoy Fresh-Tasting Coffee Every Time. Snap-Tight Lid Helps Seal In Fresh Taste And Aroma. The Inner Seal Peels Away Easily And Eliminates The Need For A Can Opener. Dark-Roast, Ground Coffee Is Designed For Use In Coffeemakers. Canister Holds Enough Coffee To Make Up To 210 Cups (6 Fluid Oz. ).